I'm back from my whirlwind trip to the Mediterranean and sorry to brag, but it was awesome. Despite the breakneck pace (nearly a city a day), I finished two books (The Metropolis Case by Matthew Gallaway, review tomorrow; and The Sergeant's Lady, by Susanna Fraser) and got halfway through Far from the Madding Crowd (which I'm enjoying so much!). I came home to a lovely pile of packages but I won't get to them for tomorrow's Mailbox Monday (laundry first, and then my bed!). I know I owe emails to many folks -- I'm working through the backlog so sorry for the delay! I've missed my bookish people -- I can't wait to catch up with everyone. Great pictures! It looks like a wonderful trip. And it's always nice to find books waiting for you when you come home! Welcome back. I love the pictures. It looks like you had a wonderful time. Wow that looks like it was a great trip! Sounds like you had a wonderful time. Welcome back! Wonderful pictures. 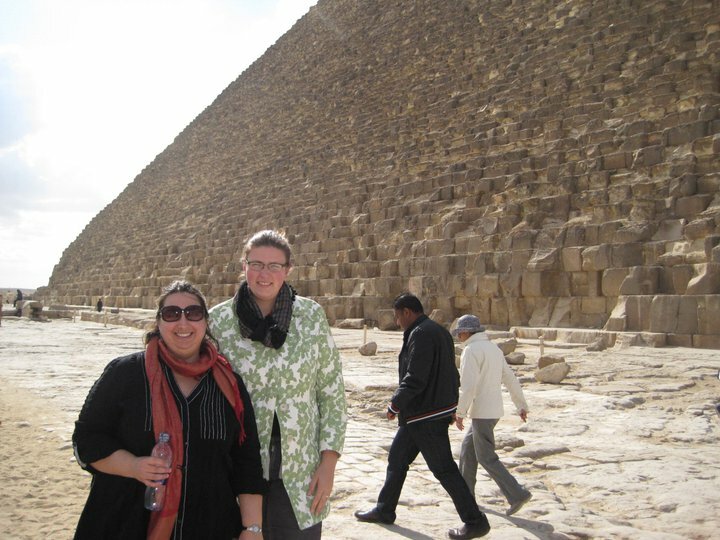 I went to high school in Cairo, Cairo American College, and our graduation ceremony was right there at the feet of the sphinx and pyramids. Looking forward to getting to know your blog after joining the nautical challenge. Oh wow! What an experience! I'm so jealous! Post more pics when you get a chance!